With unique variegation and an enhanced grain pattern, Deckorators® Heritage wood plastic composite (WPC) decking provides a one-of-a-kind look for composite decking, bringing inside trends to outdoor spaces. Heritage gives you a natural look with rustic undertones. See our two new for 2017 distressed boards: Riverhouse and Smokehouse, which feature revolutionary distressed embossing, unlike anything available in wood-alternative decking today. The new boards offer the trend-setting look and feel of distressed wood flooring, yet are made of wood-plastic composite for ultra-low maintenance performance. This rich, rustic and unique embossing pattern doesn't repeat for at least 12', so no two boards are alike! 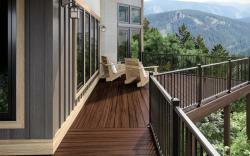 Looking for prices on Deckorators Heritage Composite Decking Materials? We can help! Fill out the form below and we will calculate how much you need, then give you a price. If we have additional questions, we will email or call you.